Headset Bluetooth premium que oferece clareza na comunicação nos dois lados da chamada e com um microfone que filtra ruídos, o PRESENCE pode ser usado até nos ambientes mais barulhentos - e por até 10h. PRESENCE ™ é um fone de ouvido Bluetooth prêmio para os profissionais na estrada, para exigir soluções de comunicação consistentemente excelentes para si e seus ouvintes. Usando um sistema de microfone digital de 3 tecnologias Speak-Focus ™ e WindSafe ™ proporcionam um som mais claro para os ouvintes em condições barulhentas e entrega clareza best-in-class Sennheiser HD para otimizar a inteligibilidade da fala em ambientes desafiadores. O fone de ouvido, fino e leve possui saída de áudio de alta qualidade para podcasts e o ActiveGard® Protege contra choque acústico. Ele oferece até 10 horas de tempo de chamada entre cargas, e maior alcance. Redução de ruído de fundo - detector Ownvoice otimiza a inteligibilidade da fala e reduz ruídos de fundo que causam distração. Are there different models in the PRESENCE Series? How does the Voice Dialing work on the PRESENCE? On the PRESENCE the voice dial works only with the last paired device. So if two mobile phones are connected at the same time then voice dial will only work with what the voice prompt refers to as "Phone 2" (ie: the last phone that was paired). Also if using a BTD 800 and it was paired after the PRESENCE was paired to a mobile phone the BTD 800 is now the device that was paired second hence it is the one that the PRESENCE it trying to use for voice dialing. Typically voice dialing via BTD 800 to softphones is not implemented by the softphone manufacturers and hence voice dial is not an option via the BTD 800. In a situation where the device that will be used with voice dialing is not in the correct sequence (ie: it is not the last device paired) you can remove existing pairings and re-pair the devices in the sequence that fits with what voice prompt needs. For example pair the PRESENCE to the BTD 800 and then pair to the mobile phone so that the mobile phone is the second device paired and hence will receive the voice dialing prompts. How do I do a factory reset on the PRESENCE headset? 1) Turn the headset off. 2) Connect the headset to a power supply using the charging cable. 3) Keep both the volume buttons pressed and power on the headset. The LED will flash purple three (3) times and then enter pairing mode (LED alternates flashing red/blue). The headset now tries to pair to a Bluetooth device. How do I turn voice commands on/off on the PRESENCE? Voice prompts are the commands from the headset that let you know certain information (ie: "phone 1 connected" or "3 hours of battery left", etc). Voice prompts are enabled as the default factory setting. 1. Turn the Presence on but make sure it's not actively paired to anything (ie: have the cell phone Bluetooth turned off). 2. Press and hold both volume buttons until you hear 4 chimes and now voice prompts are disabled. NOTE: To turn voice prompts back on repeat steps 1 and 2. What are the differences between the different PRESENCE models? NOTE: The PRESENCE is orientated towards the consumer market whereas the PRESENCE UC and PRESENCE UC ML are aimed at the professional business market for Unified Communications. On our website the PRESENCE UC and PRESENCE UC ML are on the same product page and you select the specific model from the drop down option on the page itself. What should I do if the PRESENCE mutes when Microsoft Lync Screen sharing is used? If when using the PRESENCE with Microsoft Lync screen sharing the PRESENCE begins to mute and un-mute randomly that indicates there is an interaction issue occurring between the headset and Microsoft Lync software. This issue was resolved through firmware updates so ensure that the latest firmware version has been installed on the PRESENCE. 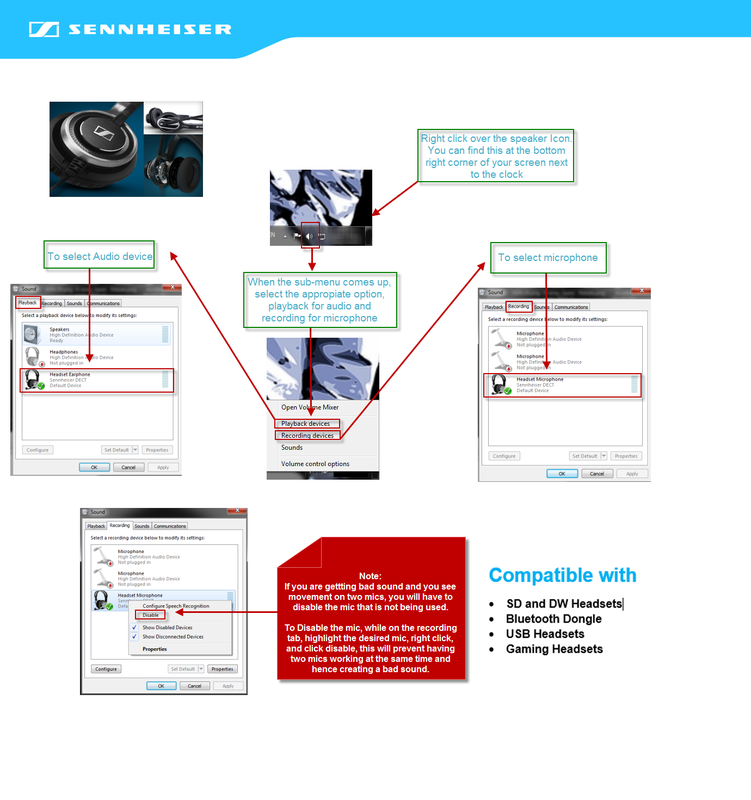 Firmware updates can be obtained through the Sennheiser Updater: (http://en-us.sennheiser.com/telecommunication-business-support-service-support-software). To install firmware connect the PRESENCE to the computer via the USB cable. Ensure the PRESENCE is deactivated or the Sennheiser Updater will not recognize it. Once the Sennheiser Updater software has recognized the PRESENCE will appear in the Sennheiser Updater. Click on the "OPTION" tab at the top of the Sennheiser Updater and then select the "Check For Updates" option. Any new firmware updates will appear and can be installed by clicking the "UPDATE" button. Why is the PRESENCE not functioning correctly on an iPhone 5? If when using the PRESENCE with an iPhone 5 the microphone quality is not optimal it indicates that there is an interaction issue occurring between the headset and iPhone 5 microphone input software. This issue was resolved through firmware updates so ensure that the latest firmware version has been installed on the PRESENCE. How do I select my USB headset as a default device? How do I set up a headset to have independent sound on the headset and PC speakers? The ability to have the communications audio (ie: phone calls through a soft phone software) separate from the computer audio is a setting within the computer's operating system. Basically you are setting the computer settings to have two (2) default playback sources. One playback source will be the headset (for all communications related audio) and one source will be the computer speakers (for the computer audio, system alerts, etc). It will depend on the computer and software that you are running as to the level of control that is allowed in configuring a component like a headset. Typically when a headset is connected to a computer there is the option of selecting it as the audio communication device or the audio playback device or both. This is typically set up through the audio settings/sound devices on the PC. If the headset was selected as both the communication device and the audio play back device all sounds from the PC would come through the headset. When the headset is selected for both audio playback and as the communication device then there should be two different sets of volume (one for audio and one for communication) that can be adjusted separately. If the headset was selected as the communication device but not the audio playback device then the headset would only be utilized in communications applications (like Skype) and other sounds would play back through the device that is selected for audio playback (like the PC speakers) hence the audio is independent of each other depending on the application. Why is there a limited frequency response range when using Bluetooth? Sennheiser headphones have a frequency response range that the headphones are capable of reproducing and this is the range that is listed in the technical specifications of the product. When Bluetooth is being used the actual frequency response range is dictated by the device that the headphones are connected to and the frequency range that the device can transmit audio over Bluetooth. Hence the headphones are limited to the range that the device is transmitting. For example if the headphones had a frequency range of 15-22,000 Hz but the device that the headphones are connected to can only transmit a frequency range of 19-19,000 Hz then the headphones are limited to this narrower range when connected to this device via Bluetooth. A2DP is the acronym for Advanced Audio Distribution Profile.